Oh, man. Where do I even begin? Should I start with the "Magic Indian Masala" Lays chips, tea time in Tibetan monasteries, trekking through the thick fog, or squatting in dirt holes for weeks on end? The overall experience was all so positively overwhelming. A careful curation of words wouldn't even come close to accurately describe the amount of inspiration I've gained through this journey... but I can try. 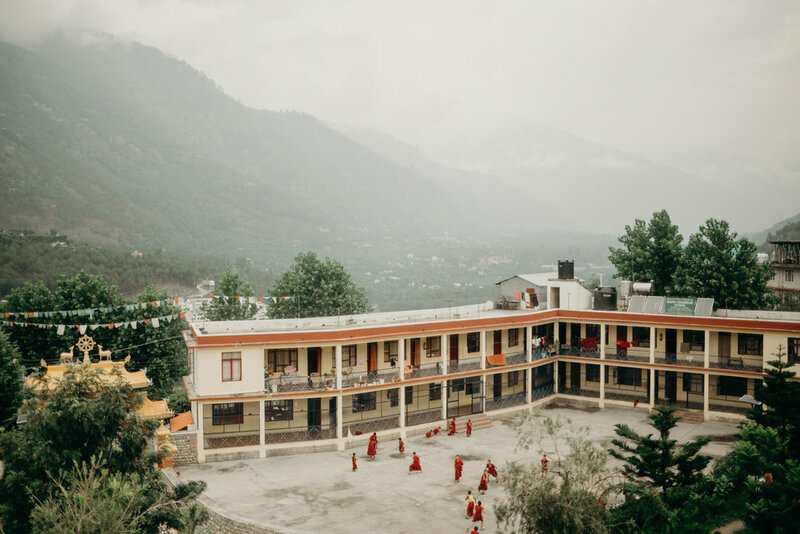 The main purpose of our expedition in India was to conduct medical-anthropolgical research on Ayurveda medicine within the Himalayan mountains of Himachal Pradesh. A team of 30+ students, professors, and doctors gathered our talents to set up travel clinics set in a variety of different villages, settlements, and monasteries throughout the northern crevasse of the country. During our journey, we had the opportunity to investigate local history, religious beliefs and practices, modern human adaptations, regional effects of globalization, monastic life, and local healthcare. In addition, through trekking and camping in remote areas, we observed the interconnectedness of the magnificent natural environment with a daily local existence. This first-hand experience was accompanied by daily yoga & meditation sessions in infamous high mountain tops. It was, without a doubt, the most magical trip I’ve ever dreamed of taking. A true once-in-a-lifetime opportunity. It has destined me for greater future accomplishments than I ever could have imagined on my own. Below are a series of captions that are direct quotes from my travel journals on this journey. I spent a lot of time with the wonderful human beings I've met on the trip as equal as I did write about my personal experiences through India. Journal Entry (July 13th, 2016): "Roaming the busy streets of Manali with my tent-mate, Stephanie. Our feet grow extra tired after a long few days of traveling here from the States. We wonder what it's like to ride in these crazy mini tuk-tuks. Do we ask? Do we jump in? We do neither. We walk forward. Again." Journal Entry (July 16th, 2016): "After completing our mission health camp for a nearby school in Bir, we students decided to take a break and roam the backyard of beautiful Himalayan Mountains. We see the pastoralists gathering grass and corn husks for their homesteads. We see children playing Ninja inside the town's water streams." Journal Entry (July 18th, 2016): "There's something so special about the way these uneven mountain tops are lied. Magnificent colors surround me. My camera, obviously, can never fully grasp the sheer magnitude of these landscapes. Sometimes it takes only the experience is indulge in these precious places. Journal Entry (July 18th, 2016): "Our 10 miles trek through Billings Pass seem to be a rather gruesome 20+ hike through the maddening streets of the Himalayas. Our leader of the pack, Neema, didn't seem to exact his measurements when processing how long it would take us to get back to base camp. Our legs were burning with sensations but our hearts were determined." Journal Entry (July 11th, 2016): "A snake-charmer charming his Boa in the busy streets of Manali, Himachal Pradesh, India. Stephanie and I forgot money to cash in our give to the old man for spending extra minutes listening to his street act; he was not very pleased with this. But damn was he entertaining." July 13th, 2016: "There's something in the tent, I think", my roommate shrieks in the middle of the night. I didn't think much of it; probably just another dirty old spider? Nope. It was a mouse. A tiny, sneaky, damned rotten mouse. We cleared out our tents so fast, it broke record time. Naturally, we skipped out on our sleep." Journal Entry (July 17th, 2016): "Working these preventative health camps exhaust me, but only in the best way possible. We've healed over 150+ patients under the limit of just 5 hours since that's about how much time they give us for the towns. Today, I've met an elderly gentle who was having trouble seeing and has asked for the eye doctor. I was listening in on their conversation and overheard what the translator was saying (...of course. World's best listener over here!). Many of these elderly men who have issues with their eyes is not because of their bad sight, but because they rub dirt in their eyes after a long, hard day's work of gardening. Therefore, there's calluses on their eyeballs!" Journal Entry (July 22nd, 2016): "...I remember the colors. These magnificent, wonderful, vibrant color pallet." Journal Entry (July 14th, 2016): "Sometimes I wish I didn't feel the incessant need to take pictures of everything around me, but I simply can't help it. Photographing / videoing the life I'm surrounded by feels absolutely necessary for me. It's how I indulge inside the present moment." Journal Entry (July 22nd, 2016): "It's funny. The people I get to so graciously meet on my travels are people that I know I'll keep in contact with (well, some of them anyways). But it makes me sad that I can't go home to Arizona with all of these and meet them for coffee whenever I so please. Many of these beautiful students / interns / professors are all across the United States. It just makes me sad. I'll miss these people." Journal Entry (July 22nd, 2016): "Trekking through Billings Pass high in the sky with beautiful company. Our feet were sore and blistered between our sweaty socks; but with views like this, all that little stuff didn't even matter." Journal Entry (July 18th, 2016): "Definitely one of my favorite hikes to date. 10,000 feet up in the air surrounded by misty fog and a plethora of prayer flags. The sharper inclines fostered a fierce burning sensation in my thighs. "Just put one foot in front of the other", I'd tell myself." Journal Entry (July 15th, 2016): Today, we played soccer with the novice monk children after our health camps. A bit of unwinding before we get back to the daily grind of tomorrow's work day. Journal Entry (July 20th, 2016): "I sit here outside the door of my tent writing just before we eat dinner. I came back from a nice dip in the cool river water and am now snuggled up in my warm pajamas from REI (thanks, Dad!). I'm so damn happy I bought these pants before my trip, my yoga ants just simply don't cut it." Journal Entry (July 15th, 2016): "This was one of our campsites in India. We ate, talked, laughed, learned, and shared a crowd of different emotions with one another. Meeting 30 new strangers on July 10th and being forced to spend a tiring 3 weeks together in rough conditions will turn all of you into good friends instantly. I miss these people and I miss this campsite. So much growth and self-reflection was made."